We've shown you what German tuner Novitec Rosso can do to the Ferrari F430, but now the company has turned its sights on the 599 GTB Fiorano. The result is 808 HP and 607 ft-lbs of torque in a package that's refreshingly subtle for a tuner car. Novitec installed its own wind-tunnel-tested aero kit, but it's integrated so well it looks Ferrari-supplied. Likewise the 21-inch alloys — the only giveaway in the wheel arches is the Novitec casting on the bright-yellow brake calipers. 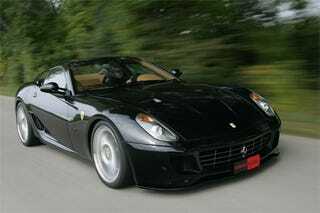 The company claims a 3.5-second 0-62 MPH time, and they'll be happy to convert your 599 Fiorano for the paltry sum of $60,500. Press release after the jump. New from NOVITEC ROSSO: Bi-Kompressor V12 Engine with 808 hp / 594 kW and 823 Nm for the Ferrari 599 GTB Fiorano A maximum rated power output of 808 hp / 594 kW, a peak torque of 823 Nm and a top speed of more than 340 km/h, all the result of a high-tech twin compressor conversion: NOVITEC ROSSO endows the Ferrari 599 GTB Fiorano with even more superlatives through professional tuning. The tuning is accompanied by an aerodynamic-enhancement kit developed in the wind tunnel, three-piece 21-inch wheels with correspondingly calibrated sports suspension, a high-performance brake system, and exclusive interior options. As for the Ferrari F430, NOVITEC ROSSO relies on mechanically supercharging the six-liter four-valve V12 engine of the F599 with two compressors for boosting performance. The cogged-belt driven high-performance superchargers produce a maximum boost pressure of 0.39 bars, and are a lubricated by their own dedicated oil circulation. The pre-compressed air is then cooled down to a level conducive for added power by a large intercooler that itself is cooled by a dedicated water cycle. A specially designed intake manifold with high-performance injectors and sport air filter round out the conversion on the intake side. In addition, NOVITEC ROSSO installs custom exhaust manifolds calibrated to the twin compressors, and the NOVITEC ROSSO stainless-steel quad sport exhaust system with a tailpipe diameter of 90 millimeters. The exhaust note can be adjusted using the 'manettino' switch on the steering wheel from 'sporty yet discrete' to 'definitely sounds like racing.' The NOVITEC ROSSO engine management coordinates the perfect interaction of all conversion components. It not only ensures maximum power yield but also exemplary smooth running and maximum longevity. Compared to the production engine the NOVITEC ROSSO Bi-Kompressor V12 gains 188 hp / 138.4 kW for a new maximum of 808 hp / 594 kW at 7,800 rpm. At the same time peak torque grows by 215 Nm to a new peak of 823 Nm at 6,300 rpm. In combination with the F1-Superfast transmission, whose six speeds are even faster and more precise to select thanks to longer NOVITEC ROSSO carbon shift paddles, the tuned F599 delivers performance on the highest super sports car level: The sprint from rest to 100 km/h takes just 3.5 seconds. 200 km/h are reached after just 9.7 seconds. And a sprint time of 25.5 seconds from 0 - 300 km/h places the tuned two-seater firmly among the fastest accelerating sports cars in the world. Top speed is more than 340 km/h. The NOVITEC ROSSO Bi-Kompressor engine conversion is available for 46,900 Euros. Such performance places extreme demands on perfectly balanced aerodynamics. The NOVITEC ROSSO designers went into the wind tunnel to develop aerodynamic-enhancement components that add some visual pizzazz to the 599 and make it more aerodynamically efficient. The front spoiler lip is attached to the production bumper and reduces lift on the front axle. Its aerodynamic counterpart in the rear is the rear diffuser that can optionally be combined with a rear spoiler. The NOVITEC ROSSO rocker panels calm the airflow between the wheel houses and with their large air inlets optimize the supply of cooling air to the rear brakes. All NOVITEC ROSSO aerodynamic-enhancement components are also available in a clear-coat carbon-fiber version. The exterior can be further refined with black side markers and black taillights as well as with LED auxiliary brake light and reversing light. The extensive high-performance package for the 599 also includes custom-tailored NOVITEC ROSSO NF3 light-alloy wheels with high-performance tires from PIRELLI. The tree-piece wheels with five double spokes measure one inch more in diameter than the stock wheels. The front axle is fitted with size 9Jx20 rims and size 275/30 ZR 20 tires. The rear wheels in size 12.5Jx21 with size 355/25 ZR 21 tires provide maximum traction. These king-size wheels offers space for the high-performance brake system developed in cooperation with Brembo. The brake uses the largest components currently legal for street use. The front and rear features steel discs with diameters of 405 millimeters and six-piston brake calipers. Together they offer an optimal combination of maximum stopping power and endurance. Bound and rebound of the height-adjustable NOVITEC ROSSO sport suspension can be adjusted to each 599 owner's individual preferences. In addition the suspension also offers a highly useful lift feature that is activated by pushing a button in the cockpit. The front of the car can be raised by 40 millimeters to navigate safely past obstacles such as parking ramps or speed bumps without scraping the front apron. The suspension automatically reverts to its original position once the car reaches a speed of 80 km/h. NOVITEC ROSSO offers the ultimate refinements for the interior of the Ferrari 599 GTB Fiorano. The list of options ranges from a leather/carbon-fiber sport steering wheel with flattened bottom for easier entering and exiting, to aluminum foot pedals, to a completely new interior in any color and material combination imaginable.